It looks great, how much does it cost? The system is provided on a subscription basis with no set up costs. The cost is based on the number of pupil user accounts and we have a wide range of price bands to cater for all school sizes. Example quotes are given below. Please contact us for a custom quote and to discuss your requirements. Example quote 1: A one form entry primary school with less than 150 pupils. Monthly direct debit (new): £27.50. Example quote 2: A primary school with 450 pupils. Monthly direct debit (new): £65. Example quote 3: A secondary school with 2,300 pupils. Monthly direct debit (new): £195. Optional MIS Integration with SIMS, RM Integris, iSAMS or Scholarpack. All prices exclude VAT, which can be reclaimed by schools. How do I know if the system will meet our school's requirements? Every system is tailored to meet your school's unique requirements. Building and customising the system for you allows us to provide a system tailored to the age range of your pupils and the features required. We have online demonstrations available - please contact us for more information. We are confident that staff and pupils will enjoy using our system so we are now happy to offer schools a free 6-week trial, subject to availability. Do I need to offer rewards? Can I just have a points system? You do not need to offer rewards to pupils. We can build a points system that just focuses on pupils achieving as many points as possible. If you do consider allowing pupils to exchange their hard-earned points for rewards, you can operate your own rewards shop through the system. Many rewards used by our schools include "skip the lunch queue" and other special privileges that are zero or low cost. We are happy to share best practice from our schools who try to make their rewards budget go further. Do we need to buy rewards from your company? No, schools have complete freedom to obtain rewards from any source. There is no definitive list of rewards to choose from and no limit to the number of rewards you can make available. Your school can decide how many points each reward is worth and we can provide features such as a "points budget" for members of staff to help your school stick to its rewards budget. We can also provide a letter template that can be used to contact local businesses that may be interested in donating rewards. How is Pupil Reward Points different from other reward systems? - Barcode scanners are optional and plastic cards are not required. - The school has complete freedom over the rewards it chooses - your school keeps its rewards budget and can set up its own rewards shop. - Pupil Reward Points was made by a teacher, for teachers. - Continually improved by feedback from its users - it is user-friendly, anyone can use it. - A different system for primary, middle, secondary and special schools, which can be customised to meet unique requirements. - We can remove or hide unwanted features, change existing features or even add new features. - Instantly access up-to-date reports on student achievement (individually, by groups, by date etc). - Colourful graphs and charts in order to see trends, not just numbers in tables. Can I somehow keep my "counters in a jar system"? We understand that some pupils respond well to receiving something tangible when being praised for their efforts, which is why we have developed points top-up vouchers. 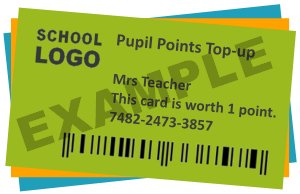 Points top-up vouchers are small slips of paper / card, or stickers that can be given to a child instead of recording points electronically. Each voucher has a unique 9 digit number that, when entered into our website, will redeem the points value of the voucher. We can also provide optional barcode scanners that can enter the voucher number automatically, making it quicker and less prone to mis-typing. Does it work with SIMS? If so, how? Pupil Reward Points can read data from SIMS relating to pupils, staff, classes, attendance, SIMS achievements and behaviour. This ensures that all information on your rewards system remains up-to-date. You only need to export data that is necessary. We use GDPR-compliant software to transfer only SIMS data that is required for the operation of your rewards system. If you would like the system to process attendance data from SIMS, it can automatically award points when a pupil is marked as present. If you would like staff to award points via SIMS achievements, we can extract them so that pupils and their parents can see the achievements via our system. Can it work without MIS Integration? Yes, each school has an administrator area where students, staff and classes can be administered manually. Small schools may prefer to do this rather than integrate their MIS software.